NEW BOOM OR NEW BUBBLE? In early 2002 Alan Greenspan declared that the American recession which had begun a year earlier was at an end. By the fall the Fed was obliged to backtrack, admitting that the economy was still in difficulties and deflation a threat. In June 2003 Greenspan was still conceding that the ‘the economy has yet to exhibit sustainable growth’. Since then Wall Street economists have been proclaiming, with ever fewer qualifications, that after various interruptions attributable to ‘external shocks’ - 9/11, corporate scandals and the attack on Iraq - the economy is finally accelerating. Pointing to the reality of faster growth of gdp in the second half of 2003, and a significant increase in profits, they assure US that a new boom has arrived. The question that therefore imposes itself, with a Presidential election less than a year away, is the real condition of the US economy. What triggered the slowdown that took place? What is driving the current economic acceleration, and is it sustainable? Has the economy finally broken beyond the long downturn, which has brought ever worse global performance decade by decade since 1973? What is the outlook going forward? 1 I wish to thank Aaron Brenner and Tom Mertes for much help on both content and style. I am also grateful to Andrew Glyn for data on inventories for Germany and Japan and Dean Baker for very useful advice on data sources. In mid-summer 2000, the US stock market began a sharp descent and the underlying economy rapidly lost steam, falling into recession by early 2001. Every previous cyclical downturn of the post-war period had been detonated by a tightening of credit on the part of the Federal Reserve, to contain inflation and economic overheating by reducing consumer demand and, in turn, expenditure on investment. But in this case, uniquely, the Fed dramatically eased credit, yet two closely interrelated forces drove the economy downward. The first of these was worsening over-capacity, mainly in manufacturing, which depressed prices and capacity utilization, leading to falling profitability - which in turn reduced employment, cut investment and repressed wage increase. The second was a collapse of equity prices, especially in high technology lines, which sent the ‘wealth effect’ into reverse, making it harder for corporations to raise money by issuing shares or incurring bank debt, and for households to borrow against stock. 2 The National Bureau of Economic Research declared a recession to have begun in February 2001 and to have ended in November 2001. In this text, I use the term recession only in the formal sense of the nber. Otherwise, I generally speak of slowdown, to refer to the economic slackening that was set off by developments in the second half of 2000 and continued till mid-2003, at least. 3 Typical in this respect is Joseph Stiglitz, ‘The Roaring Nineties’, The Atlantic Monthly, October 2002. Despite his self-described role of critic of the bubble economy, this much-admired Nobel Prize winning economist is in fact exemplary of the Wall Street publicity machine in refusing to be moved by mere numbers. As chair of the Council of Economic Advisers, he would appear to have been well placed to discover basic government data on the economy. But he states, preposterously, that ‘the height of the 1990s boom’ was ‘a period of unprecedented growth’ with ‘productivity levels that exceeded even those of the boom following World War ii’. In reality, in terms of all the standard economic variables, economic performance in the half decade 1995–2000 was less good than in the entire quarter century 1948–73. The average annual rate of labour productivity growth in the non-farm business economy for 1995–2000, at 2.5 per cent, was well below that for 1948–73, at 2.9 per cent. ‘Multifactor Productivity Trends, 2001’, bls News, 8 April 2003, p. 6, Table b (available on the bls website). See also The Boom and the Bubble, London 2002, p. 221, Table 9.1. 4 See The Boom and the Bubble, p. 47, Table 1.10. What continued to repress private sector profitability and prevent any durable economic boom was the perpetuation of a long-term international - that is, systemic - problem of over-capacity in the manufacturing sector. This found expression in the deep dip of - already much reduced - manufacturing profitability in both Germany and Japan during the 1990s, and in the inability of US manufacturers to sustain the impressive recovery in their rates of profit between 1985 and 1995 much past mid-decade. It was manifested too in the series of increasingly deep and pervasive crises that struck the world economy in the last decade of the century - Europe’s erm collapse in 1993, the Mexican shocks of 1994–95, the East Asian emergency of 1997–98, and the crash and recession of 2000–2001. The roots of the slowdown, and more generally the configuration of the us economy today, go back to the mid-1990s, when the main forces shaping the economy of both the boom of 1995–2000 and the slowdown of 2000–2003 were unleashed. During the previous decade, helped out by huge revaluations of the yen and the mark imposed by the US government on its Japanese and German rivals at the time of the 1985 Plaza Accord, US manufacturing profitability had made a significant recovery, after a long period in the doldrums, increasing by a full 70 per cent between 1985 and 1995. With the rate of profit outside of manufacturing actually falling slightly in this period, this rise in the manufacturing profit rate brought about, on its own, a quite major increase in profitability for the US private economy as a whole, lifting the non-financial corporate profit rate by 20 percent over the course of the decade, and to its level of 1973 for the first time since 1969. On the basis of this revival, the US economy began to accelerate from about 1993, exhibiting, at least on the surface, greater dynamism than it had in many years. Nevertheless, the prospects for the American economy were ultimately limited by the condition of the world economy as a whole. The recovery of US profitability was based not only on dollar devaluation, but a decade of close to zero real wage growth, serious industrial shake-out, declining real interest rates, and a turn to balanced budgets. It therefore came very much at the expense of its major rivals, who were hard hit both by the slowed growth of the US market and the improved price competitiveness of US firms in the global economy. It led, during the first half of the 1990s, to the deepest recessions of the post-war epoch in both Japan and Germany, rooted in manufacturing crises in both countries. In 1995, as the Japanese manufacturing sector threatened to freeze up when the exchange rate of the yen rose to 79 to the dollar, the US was obliged to return the favour bestowed upon it a decade earlier by Japan and Germany, agreeing to trigger, in coordination with its partners, a new rise of the dollar. It cannot be overstressed that with the precipitous ascent of the dollar that ensued between 1995 and 2001 the US economy was deprived of the main motor that had been responsible for its impressive turnaround during the previous decade - viz. the sharp improvement in its manufacturing profitability, international competitiveness, and export performance. In so doing, it set stage for the dual trends that would shape the American economy throughout the rest of the decade and right up to this day. The first of these was the deepening crisis of the US manufacturing sector, of exports, and (after 2000) of investment; the second was the uninterrupted growth of private sector debt, household consumption, imports, and asset prices, which would make for the sustained expansion of a significant portion of the non-manufacturing sector - above all finance, but also such debt-, import-, and consumptiondependent industries as construction, retail trade, and health services. Greenspan’s deliberate reliance on the wealth effect of the stock market can be seen in his public statements of the period, especially his testimonies before the Joint Economic Committee of Congress in June and July 1998. Once equity prices took off, corporations - especially in information technology - found themselves with unprecedentedly easy access to finance, either through borrowing against the collateral ostensibly represented by their stock market capitalization or the issuance of shares. As a consequence, the indebtedness of non-financial corporations skyrocketed, approaching record levels by the end of the decade. Whereas throughout the post-war epoch, corporations had financed themselves almost entirely out of retained earnings (profits after interest and dividends), now firms that could not borrow cheaply turned to the equity market for funds to an extent that had been previously inconceivable. On these foundations, investment exploded upwards, increasing at an average annual rate of about 10 per cent and explaining, in growth accounting terms, about 30 per cent of the increase in gdp between 1995 and 2000. Consumer expenditures jumped sharply, helping mightily to soak up the increased output generated by rising investment and productivity. Between 1995 and 2000, a powerful boom took shape, marked by an acceleration of output, productivity, employment and, eventually, real wage growth. But this boom was almost entirely dependent upon a stock market run-up that had no basis in underlying returns to corporations. Occurring as it did in the face of the downward trend in profitability - and made possible by increases in corporate borrowing and household consumption that were both dependent upon the stock market bubble - much of the growth in investment of the second half of the decade was inevitably misallocated. The scope and depth of over-capacity was thus very much extended, especially into high-technology industries both within and outside of the manufacturing sector, exacerbating the decline in profitability. Across the economy, the reductions in the growth of costs that resulted from increased productivity were more than offset by the deceleration of price increases that stemmed from the outrunning of demand by supply. Consumers thus ended up as the primary - if only temporary - beneficiaries of a self-undermining process that brought inexorably increasing downward pressure on profits. Between 1997 and 2000, as both the boom and the bubble reached their apogee, the non-financial sector as a whole sustained a fall in profit rate of almost one-fifth. But the ascent of neither the real economy nor its on-paper representation in the form of asset prices, could long defy the gravitational pull of falling returns. From July 2000, a series of ever-worsening corporate earning reports precipitated a sharp cyclical downturn, both by reversing the wealth effect and by revealing the mass of redundant productive capacity and mountain of corporate indebtedness that constituted the dual legacy of the bubble-driven investment boom. With their market capitalization sharply reduced, firms not only found it more difficult to borrow, but less attractive to do so, especially since declining profits and the growing threat of bankruptcy led them to try to repair balance sheets overburdened by debt. Having purchased far more plant, equipment, and software than they could profitably set in motion, they were obliged either to reduce prices or leave capacity unused, sustaining falling profit rates either way. To cope with declining profitability, firms cut back on output and capital expenditures, while reducing employment and wage growth so as to bring down costs. Across the economy these moves radically reduced aggregate demand, pushing the economy downward, while exacerbating profitability decline by depressing capacity utilization and productivity growth. The relentless burden of interest payments on the huge overhang of corporate debt compressed profits even further. Between the year ending in mid-2000 and the year ending in mid-2001, gdp growth fell from 5 per cent to minus 1 per cent per annum and investment from 9 per cent to minus 5 per cent - in both cases faster than at any other time since World War ii - sending the economy into a tail-spin. In 2001, 2002, and the first half of 2003, employment in the non-farm economy (measured in hours and including the self-employed) fell by 2 per cent, 2.5 per cent, and 1.5 per cent respectively, after having increased at an average annual rate of more than 2 per cent between 1995 and 2000. This in itself entailed an enormous hit to aggregate demand, an inexorable and persistent downward pull on the economy. Simultaneously real hourly wages, which had grown 3.5 per cent in 2000, were brutally cut back - to minus 0.1 percent, 1.2 per cent, and 0.3 per cent, respectively, in 2001, 2002, and the first half of 2003. As a result of the combination of reduced hourly wage growth and falling employment, total real non-farm compensation - the main element of aggregate demand - fell by 1.2 per cent, 1.4 per cent, and 0.2 per cent, respectively, in 2001, 2002, and the first half of 2003, after increasing at an average annual pace of 4.3 per cent between 1995 and 2000. Perhaps most striking of all, after having grown at an average annual rate of 10 per cent between 1995 and 2000, real expenditures on plant and equipment fell sharply in 2001 and 2002, and were flat in the first half of 2003. All else being equal, these huge blows to consumer and investment demand, resulting from the mammoth reductions in employment, compensation, and capital spending growth, would have kept the economy in, or near recession, right into the present. As it was, even in the face of the government’s enormous stimulus programme, they were responsible for driving average annual growth of non-farm gdp from 4.6 per cent between 1995 and 2000 to minus 0.1 per cent in 2001 and preventing it from going higher than 2.7 per cent in 2002 and 2.6 per cent in the first half of 2003. Exacerbating the downturn, US overseas sales also plummeted. Over the previous two decades the growth of US exports had tended to depend, paradoxically, on the increase of US imports. This is because they relied upon a world economy whose increasingly export-dependent growth had itself become ever more reliant upon the growth of US imports. The stock market’s last upward thrust in the final couple of years of the century had rescued the world economy, as well as US exports, from the East Asian crisis by setting off a short lived import boom, especially in information technology components. But with US equity prices and investment collapsing, especially again in ‘new economy’ sectors, the process was reversed. Japan, Europe, and East Asia now lost steam as fast as the us, while much of the developing world, notably Latin America, was plunged, after a brief honeymoon, back into crisis. Because the economies of the us’s trading partners had become so dependent on sales to the US - and because the US possesses a far greater propensity to import than does either the EU or Japan - the descent into recession reduced the capacity of the rest of the world to absorb us imports more than vice versa. In 2001, 2002, and the first half of 2003, us export growth therefore fell even further behind US import growth than previously. US real imports, after having increased by 13.2 per cent in 2000, dropped by 2.9 per cent in 2001, then grew by 3.7 per cent and 2.25 respectively, in 2002 and the first half of 2003. US real exports, on the other hand, after growing by 9.7 per cent in 2000, fell by 5.4 per cent, 3.6 per cent, and 0.1 per cent in 2001, 2002 and the first half of 2003. As the rest of the world, deprived of the American motor, slowed down, the US could look only to itself to launch an economic recovery upon which the whole global economy depended. To stem the plunge, from January 2001 onwards the Federal Reserve lowered the cost of borrowing with unprecedented rapidity, reducing short-term interest rates on eleven occasions, from 6.5 per cent to 1.75 per cent, over the course of the year. But, as the Fed discovered, interest- rate reductions are much more effective in reviving an economy in which consumption has been restricted by a tightening of credit - as in all previous post-war cyclical downturns - than in re-starting an economy driven into recession by declining investment and employment resulting from over-capacity, making for falling rates of profit. Vastly over-supplied with plant and equipment, non-financial corporations had little incentive to step up capital accumulation, no matter how far interest rates were brought down by the Fed. On the contrary, having increased their indebtedness from 73 to 90 per cent of their gdp between 1995 and 2000, they had every motivation to restore their balance sheets by trying to save more, and their so doing made it that much more difficult for them to invest. Whereas vastly increased apparent wealth derived from market capitalization allowed non-financial corporations to raise their borrowing as a proportion of their income to a near record 8 per cent for 1998, 1999, and 2000 taken together, they were obliged sharply to reduce it to 4.6 per cent, 2.1 per cent, and 2.6 per cent, in 2001, 2002 and the first half of 2003, as the value of their stock dramatically contracted. Real non-residential expenditures on plant and equipment thus fell like a stone, declining from an average annual rate of 10.1 per cent between 1995 and 2000 to an average annual rate of minus 4.4 per cent between 2000 and the middle of 2003. It has been the failure of investment to revive that has constituted the ultimate factor holding back the economy. The manufacturing sector was the main, almost exclusive, site and source of the economic slowdown, as developments maturing over the previous half-decade came to fruition. Although by the middle 1990s this sector had come to constitute only 29.3 per cent and 32.7 per cent, respectively, of corporate and non-financial GDP, as late as 1995, manufacturing still accounted for 42.5 and 50 per cent, respectively, of corporate and non-financial corporate profits (before payment of interest). As a consequence, manufacturing’s descent into crisis meant crisis for the whole economy. Between 1995 and 2000, the growth of costs in the US manufacturing economy posed no threat to profitability. On the contrary: productivity growth in manufacturing grew so rapidly that it more than cancelled out the rise of wages, with the result that unit labour costs fell at an impressive average annual rate of more than 1 per cent a year over the quinquennium. Even so, US producers found it vastly more difficult to defend, let alone expand, their markets and profit margins during this period, because they had to face an appreciation of the dollar in tradeweighted terms of 21 per cent and, from 1997, crisis conditions on the world market. World export prices, measured in dollars, fell at the stunning rate of 4 per cent per annum over the half decade, with the consequence that, while US manufacturing exports increased at an average annual rate of 7 per cent a year, manufacturing imports rose 40 per cent faster, at 10 per cent per annum, and their share of the US market jumped by a third. Despite falling production costs, price pressure was therefore so intense that the manufacturing sector maintained its rates of profit only between 1995 and 1997, and then simply because wage pressure was so weak in those two years, real wages falling by 1.5 per cent. Between 1997 and 2000, prices fell even more than did unit labour costs, with the result that, in that short period, as the economy bubbled over, the manufacturing rate of profit fell by 15 per cent. In 2001 the crisis in manufacturing reached a climax, as competitive pressures from the world market intensified and were vastly complicated by the slowdown of the domestic market. As world manufacturing prices dropped by a further 2.4 per cent and US manufacturing exports (nominal) fell by 7 per cent, American manufacturers saw growth in real domestic consumption cut by half. In the face of these contractions, us manufacturing gdp dropped by a staggering 6 per cent and capacity utilization declined by 7.1 per cent. Meanwhile, real manufacturing investment fell by 5.4 per cent. With output and capacity utilization, as well as expenditures on new plant, equipment, and software, falling off so rapidly, there was no way employers could reduce the labour force fast enough to prevent a huge fall in productivity growth. Employment (measured in hours) was in fact cut back by 4.8 per cent. But the growth of output per hour in manufacturing still plunged from 6.1 per cent in 2000 to minus 0.4 per cent in 2001. Manufacturing firms responded to these excruciating pressures by battening down employees’ compensation: real wages, which had grown 3.9 per cent in 2000, fell 1.2 per cent in 2001. But with productivity as well as capacity utilization diving, employers still could not prevent unit labour costs from rising by 2 per cent. Nor could they stop domestic manufacturing prices from falling by 0.4 per cent, after a 2 per cent drop in 2000. The outcome was that in 2001 the rate of profit for the manufacturing sector fell a further 21.3 per cent, to a level over a third down from its 1997 peak. Between 1997 and 2001, as corporate indebtedness rocketed, manufacturing net interest as a proportion of manufacturing net profits rose from 19 per cent to 40.5 per cent, a post-war record. Partly as a consequence, by 2001 manufacturing profits net of interest had fallen a total of 44.4 per cent from their high point in 1997. The profitability crisis struck all across manufacturing, including traditional industries from textiles to steel to leather. But the eye of the storm was the information technology sector, which is located for the most part in durable goods manufacturing, but includes a few industries outside manufacturing, most notably telecommunications. Business services, which cater largely to manufacturing corporations, were hard hit, too. The high- tech industries had been the main beneficiaries of the financial largesse generated by the stock market run-up, becoming the leading agents of over-investment, and, in turn, the main victims of over-capacity, falling profits, and over-burdened balance sheets. Many experienced huge falls in their profit rates. Even where their profit rates did not fall spectacularly, these industries generally experienced very major declines in their absolute profits after payment of interest, due to the huge cost of servicing the enormous debts that they had run up during the bubble. 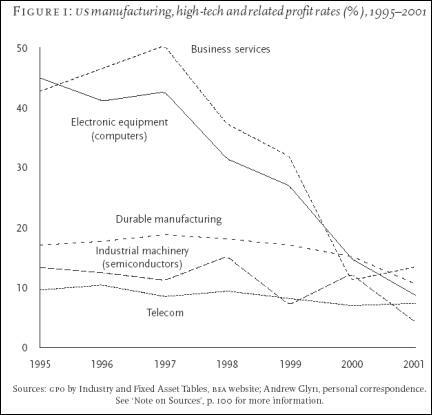 Between 1995 and 2001, profits excluding interest in electronic equipment (including computers) fell from $59.5 billion (1997) to $12.2 billion, in industrial equipment (including semi-conductors) from $13.3 billion to $2.9 billion, in telecommunications from $24.2 billion (1996) to $6.8 billion, and in business services from $76.2 billion (1997) to $33.5 billion. As it was, the profitability crisis in manufacturing was severe enough in 2001 to inflict a 10 per cent fall in the rate of profit on the non-financial corporate sector as a whole. By 2001, the non-financial corporate profit rate, having already experienced a 19 per cent decline between 1997 and 2000, had fallen by a total of 27 per cent from its 1997 peak. It is from the manufacturing sector, and related industries, that the most powerful downward pressures on the economy have continued to emanate, as manufacturing employers have cut back mercilessly in order to restore profits. In 2002 and the first half of 2003, they reduced output by 0.4 per cent and 2.8 per cent, respectively,  and brought down investment quite a bit faster, at an average annual rate of 5 per cent or more. Above all, they radically reduced employment. Between July 2000 and October 2003, employers eliminated 2.8 million jobs in the manufacturing sector. This was well over 100 per cent of the total of 2.45 million private sector jobs lost in the same period - meaning that the economy outside manufacturing actually gained jobs in this period. Since its most recent peak in 1997 peak, the manufacturing sector has lost one-fifth of its labour force. Largely as a consequence, after having increased at an average annual rate of 3.8 per cent between 1995 and 2000, total compensation in manufacturing fell at the annual average rate of 3.1 per cent between the end of 2000 and the middle of 2003, thereby accounting, once again, for most of the decline in real total compensation that took place in the non-farm economy during that period. By way of its continual, powerful restraining effect on the growth of effective demand, the crisis of investment and employment has been the main depressive factor in the overall economy since the slowdown began in the latter part of 2000 - and the collapse of investment and employment in the manufacturing sector has been largely behind that crisis. 7 Parts of the non-manufacturing, non-financial corporate sector also experienced intense profitability problems, including telecommunications, business services, and the airline industry; but their losses were offset by gains of other industries. 8 These figures are for gross output, not value added (gdp). They are therefore firstapproximations. The standard value-added numbers will not be made available bythe Bureau of Economic Analysis until next year. 9 This assumes that the fall in manufacturing investment was at least as great in the private economy as a whole. Figures for manufacturing investment for 2002 and 2003 are not yet available. Through the middle of 2003, Greenspan’s historic interest rate reductions ran up against a wall of industrial over-capacity and corporate indebtedness, failing to stem the slowdown of investment, to stimulate corporate borrowing, or to impart new dynamism to manufacturing and related industries, especially in the form of job growth. The Fed therefore had no choice but to fall back on driving up consumption growth to keep the economy turning over. In this it has to a significant degree succeeded, with the consequence that the economy has ended up following a paradoxical two-track trajectory. Manufacturing and related industries have continued a profound contraction whose origins go back to 1995, and lie in ongoing global over-capacity, intensifying overseas competition, and a long overvalued dollar. But major parts of the of the non-manufacturing sector have, by contrast, succeeded in sustaining an expansion that also originated in the mid-1990s, due to the perpetuation throughout the boom and right through the ensuing slowdown of broader trends and conditions dating back to that point - notably the ever easier availability of cheap credit, the continued blowing up of asset price bubbles, the impetuous and unending growth of debt, the creditdriven increase of consumer spending, and the dizzying rise of imports made cheap by the high dollar. To some extent, Alan Greenspan’s reduced interest rates could directly foster borrowing, and thereby consumption. During economic slowdowns, households typically need to increase their borrowing in order to cover the loss of income that results from slowed wage growth and rising unemployment. But precisely because they face downward pressure on their incomes, households face inherent limits to their ability to increase the burden of debt they can take on. In 2001, due to layoffs and the holding down of wages, total real compensation of all workers, including those working for the government, fell by 1.7 per cent compared to the final quarter of 2000; it dropped another 0.1 per cent in 2002; and it rose by only 0.4 per cent in the first half of 2003. The intent of the Fed has been to overcome the limitations of such stagnant incomes by reviving - or perhaps more precisely continuing - its strategy of the 1990s, namely to stimulate the economy by relying on wealth effects. Once more Greenspan has thus sought to push up asset prices, inflating paper wealth, in order to enhance the capacity to borrow and thereby to spend. But, in the wake of the deep fall of profitability from 1997 and of equity prices from the middle of 2000, as well as corporations’ preoccupation with reducing indebtedness by cutting back on borrowing, he has had to shift emphasis. The Fed is still attempting to boost the stock market to improve the financial condition of corporations and the business outlook more generally. But it has had to place its hopes for stimulating the economy primarily on driving down mortgage rates and pushing up housing prices, so as to pave the way for increased household borrowing and consumer spending (including investment in houses). In their own terms, these hopes have been spectacularly realized. With their collateral sharply increased and their cost of borrowing radically reduced, households were able to ramp up their borrowing rapidly, even as the economy slowed down, hourly real wage growth declined, and unemployment rose. Already between 1998 and 2000, household borrowing as a proportion of annual household income, averaging 7.5 per cent, was approaching the historic highs reached in the mid-1980s. Starting in 2001, it climbed steeply, and during the first half of 2003, smashed all records at close to 12 per cent. The growth of household debt accounted for 70 per cent of the total growth of private non-financial debt outstanding between 2000 and 2003. Almost all of the household borrowing in these years - 85 per cent - was by way of home mortgages made possible by housing price inflation and reduced interest rates; less than a mere 15 per cent through other forms of consumer credit, which evidently were held down by the stagnation of incomes. By taking advantage of the appreciation in the value of their homes, and the fall in borrowing costs, households have been able to ‘cash out’ huge sums from their home equity - by way of home sales, refinancing and second mortgages - and so to play to the hilt their assigned role of driving the economy by sustaining the growth of consumption. Between 2000 and the middle of 2003, the increase of real consumption expenditures reached 2.8 per cent per year, despite the fact that, as noted, total real compensation actually declined in the same period. The sustained growth of consumption, itself dependent upon the growth of household debt, was the determining factor behind increases in gdp from 2000 onwards - in limiting the precipitous descent of the economy in 2001, in stabilizing it in the winter of 2001–02, and in stimulating the growth that has taken place in the period since. 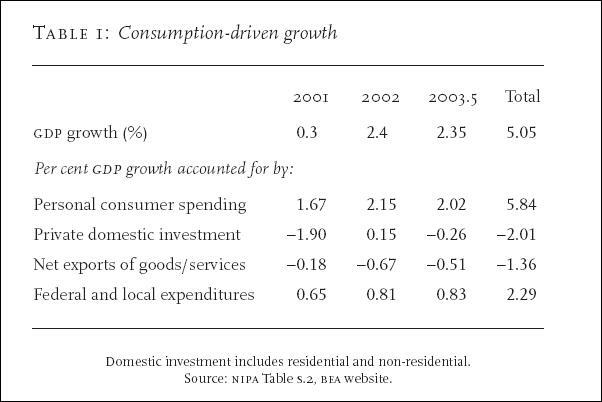 In national accounting terms, the increase of personal consumption expenditures was responsible for almost all of the gdp increase that took place between 2000 and the second half of 2003. 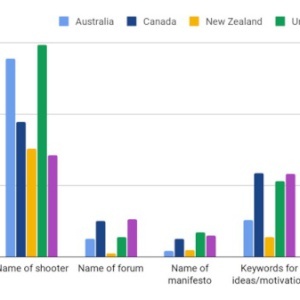 By itself, it accounted for 16 per cent more growth than actually took place in that period. Put another way, it not only offset, by itself, the substantial negative impact on gdp growth of falling investment and a widening trade deficit, but accounted in addition for about 50 per cent of the positive growth that took place. Having fallen to 0.3 per cent in 2001, gdp growth reached 2.4 per cent in 2002 and 2.3 per cent in the first half of 2003 (annualized). The Fed is betting the bank that the growth of consumption will hold up long enough for corporations to work off their excess capacity, begin investing and hiring again, and allow the almighty consumer to take a rest. That’s what’s required to restore the economy to a semblance of health. While the Fed implemented its monetary stimulus, the Bush administration added what looks like a major fiscal stimulus modelled after that of Ronald Reagan, forcing through Congress enormous cuts in taxation and major increases in military spending. But these measures are less potent than they look. The administration has thrown a few small bones to the mass of the population - cash grants to the states to help cover the cost of medicare, a reduction in taxes on married people, an increase in the tax credit for child care, and the moving forward in time of reductions in rates called for by the tax act of 2001. But all these measures taken together are worth only about $35 billion in 2003. They can give the economy a palpable temporary boost. But their impact on the $11 trillion economy is bound to be fleeting. The remaining tax reductions mainly decrease the levy on dividends and therefore benefit the very rich almost exclusively. Their effect will be much more to increase savings and the purchase of financial assets than to boost consumption, doing little to improve aggregate demand. The fact that tax cuts at the federal level will have the effect of reducing revenue to money-strapped state governments, forcing them to cut back on spending and in some cases to increase taxation, is likely to counteract much, though not all, of what stimulus they do impart. 10 H. Wood, M. A. Walton, and A. Sonthalia, ‘Defense Budget Apt to Remain on Track’, Morgan Stanley Equity Research Aerospace and Defense, 16 December 2002; T. Bennett et al, ‘Global News, Valuations and Forecasts,’ ibidem, 12 November 2002.I wish to thank Aayush Sonthalia for making these available to me. 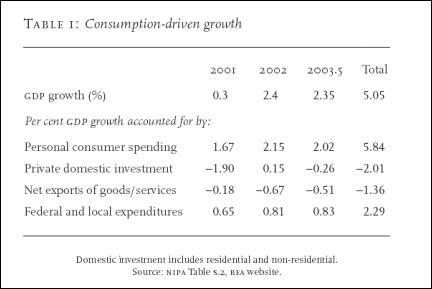 11 In the second quarter of 2003, ballooning expenditures on the Iraq War lifted therate of (otherwise lagging) gdp growth significantly, but it seems doubtful whether these are sustainable. Of course, as the economy decelerated, the combination of huge tax breaks for the rich and giant increases in military spending sent the federal government once more deeply into the red. By 2000, thanks to the speculative boom, and huge capital gains from the appreciation of stocks, the federal budget had gone positive to the tune of $236 billion. In just two and a half years, however, it had fallen into negative territory by a whopping $450 billion. Since the economy was sputtering, Keynesian deficits were very much in order. But since so much of the motivation of the Administration’s package was political and military, rather than strictly economic, it is not surprising that the way in which it has plunged public finances from surplus to deficit has been minimally efficient as a stimulus to economic growth. Due to the sustained increase in consumption, driven by fast rising household and, to some extent, government debt, a good part of the economy outside manufacturing has come through the slowdown in relatively good shape. Even in the recession year 2001, the rate of profit for the entire non-financial corporate economy outside of manufacturing actually rose slightly, and it has risen a lot faster in 2002 and the first half of 2003. On the assumption that manufacturing output has remained roughly flat in this interval, gdp in the non-farm non-manufacturing sector has risen at an annual average rate of better than 3 per cent. Jobs there increased by 600,000 between July 2000 and July 2003. Even total compensation has increased, if only slightly. Within non-manufacturing, those sectors best positioned to take advantage of falling interest rates, accelerated indebtedness, rising consumer spending, runaway import growth, and rising asset prices - notably, construction, retail trade and, above all, finance - have done extremely well, imparting a distinctive cast to the economic trajectory of the US in the new millennium. The construction industry has enjoyed its greatest boom in the postwar epoch, and for obvious reasons. The economy has grown virtually non-stop for a dozen years, placing unprecedented strain on the supply of housing. Since the mid-1990s, moreover, the growth of consumption, buoyed by ever easier access to borrowing, has increased even faster, magnifying the impact on the demand for housing of the sustained economic expansion. The inevitable consequence has been a spectacular increase of house sales and housing prices. Meanwhile, the growth of real wages in construction - where what had once been a highly organized industry is now largely de-unionized - has been held below 1 per cent per annum for the past ten years. Over the previous 15 years, between 1978 and 1993, construction real wages fell at an average annual rate of 1.1 percent - a total of 14 per cent. The rate of profit in the construction industry has thus soared as never before, increasing by a factor of six in the decade ending in 2001 and reaching a level in that year 50 per cent higher than at any previous time since 1945, including the long post-war boom. The prosperity of the retail trade, like that of the construction industry, was built on well over a decade of wage cutting. Between 1978 and 1991, real compensation in this sector fell at an average annual rate of 1.6 per cent, or 19 per cent in total. Over the next decade, retailers benefited not just from the general expansion of the economy, but from the particularly rapid increase of consumer expenditures - yuppie spending sprees fuelled by the wealth effect. They were further favoured by the unstoppable rise of the dollar that cheapened imports, paving the way for a rising tide of inexpensive goods of every description from China. Between 1995 and 2002, the PRC became the leading exporter to the us, as Chinese imports rose from $44 billion to $122.5 billion, bounding forward at an average annual pace of 16 per cent. In this process, Wal-Mart - now the world’s largest corporation - has played a much publicized starring role, accounting today for no less than 10 per cent of all imports from China, taking advantage of the over-production that is rife in so many Chinese industries to demand ever lower prices. But many other American retailers also did extremely well out of this commerce. Between 1992 and 2001, retail trade employment increased by 2.4 million or 19 percent. Over the same interval, the profit rate in retail trade increased every year, by a total of 57 per cent, including an 8 per cent increase in the recession year 2001. 12 P. Wonnacott, ‘Behind China’s Export Boom, Heated Battle Among Factories’, Wall Street Journal, 13 November 2003. 13 Space precludes consideration of the (much smaller) hotel and accommodations industry, which followed a roughly similar trajectory to that of retail trade, its employment increasing by more than 20 percent and its rate of profit rising by 50 per cent between 1992 and 2001. Another consumption-driven case of a different sort, that requires much further study, is the vast health services industry, which registered huge jumps in corporate profits - from $4.9 billion in 1989 to $15.4 billion in 1994 to $17.3 billion in 1999 to $24.8 billion in 2001, not to mention a near 50 per cent expansion in employment. The expansion of the financial sector ran parallel to that of both construction and retail trade, but was of a different order entirely. Over the course of the 1990s, it assumed truly revolutionary proportions, transforming the map of the American economy and stretching uninterruptedly into the opening years of the new millennium. The turn to finance began in earnest with the shift to monetarism, high interest rates, a strong dollar and financial de-regulation at the start of the 1980s. It resulted, in particular, from the failure of a decade-long attempt to quell the decline of non-financial profitability, especially in manufacturing, with Keynesian deficits and a low dollar. But, despite ongoing steps to unshackle the financial sector and very major run-ups in both the bond market and the stock market during the 1980s, the combination of a debt-driven mergers and acquisitions craze, commercial real estate bubble, and equity inflation had by the end of the decade issued in major crises not only for commercial banks and developers, and the savings and loans, but even the non-financial corporations themselves. All this changed in the 1990s, once Alan Greenspan had bailed out the financial sector. With the onset of the recession of 1990–91, Greenspan not only brought short-term interest rates down dramatically, enabling banks to pursue with ever-improving results their standard policy of borrowing cheap short-term and lending dear long-term. In addition, he allowed banks, in violation of government regulations, to hold onto enormous quantities of long-term bonds, which appreciated spectacularly as long-term interest rates declined, without setting aside funds to cover associated risk. Financial sector profits were restored almost instantaneously, and they began a vertiginous ascent that has yet to be interrupted. 14 Stiglitz, The Roaring Nineties, London 2003, p. 43. Every major trend of the decade of the 1990s, economic and political, ran in favour of finance. The real economy enjoyed continuous growth. Clinton’s turn to budget balancing plus the impetuous rise of the dollar in the wake of the reverse Plaza Accord - both engineered by his economic czar Robert Rubin, formerly ceo at Goldman Sacks - reduced inflation to a minimum, defending real returns from lending (just as they hurt returns in manufacturing). Clinton and Rubin pushed banking de-regulation to its logical conclusion, opening the way for the rise of ‘one-stop financial supermarkets’ that could make hitherto separated commercial banking, investment banking and insurance functions work together to magnify profits. Above all, the stock market bubble offered historically unmatched opportunities to rake in fees and profits for superintending share issues and mergers and acquisitions, while seeing to the finance of corporate and consumer borrowing. Finally, as the decade, and the equity price bubble, neared a climax, the nascent run-up in housing offered the financial sector still another huge field with multiple opportunities for killings. 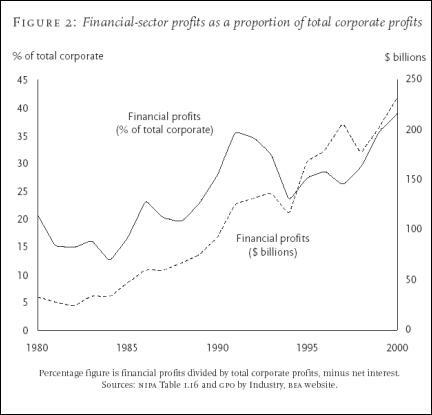 Between 1994 and 2000, profits for the financial sector doubled. Since, in the same period, profits in the non-financial corporate sector increased by only 30 per cent, financial sector profits as a proportion of total corporate profits climbed from 23 to 39 per cent. In so doing, they accounted for 75 per cent of the increase in corporate profits achieved in these years. 15 S. Galbraith, ‘Trying to Draw a Pound of Flesh Without a Drop of Blood’, Morgan Stanley US and the Americas Investment Research, 8 September 2003; S. Galbraith ‘Fading Fog’, Morgan Stanley US and the Americas Investment Research, 21 September 2003. The Morgan Stanley data is for s&p 500 corporations. Adequate government data is not yet available on profits for financial sector after 2001. The extraordinary growth in financial profits as a share of corporate profits and of their increase reflects, of course, in part the depressed state of profits outside finance. The Fed’s turn to ever easier credit brought a semblance of order to the non-manufacturing economy, further rises in profitability for the construction industry and retail trade, and the continuation of an epochmaking expansion of the financial sector. But it did so, in large part, by means of - and at the cost of - inflating the value of financial assets across the board far beyond the worth of the underlying assets that they represent. The ensuing bubbles have provided the collateral required to support ever greater borrowing so as to keep consumption rising and the economy turning over. The outcome has been that US economic growth in the past three years has been driven more by increases in demand generated by borrowing against the speculative appreciation of on-paper wealth, than by demand generated by increased investment and employment, driven by rising profits. Equity prices of course fell sharply from mid-2000. But, paradoxically, their decline failed even to begin to bring stock values into line with underlying profits, because the latter fell just as far. By October 2002, when equity prices bottomed out, the s&p 500 composite index was 42 per cent below its peak of July 2000; but the earnings-price ratio (i.e. the rate of return on investment in equities), which had already dropped by 48 per cent between its early 1995 peak and mid-2000, failed to rise at all, remaining stuck at around 3.7:1, meaning that equity investments yielded an average annual return of under 4 per cent. In the absence of the Fed’s cheap credit policy, share prices would obviously have fallen a great deal further with respect to underlying earnings. But by implication the equity price bubble was never allowed to burst. A few months later, that bubble began a new expansion. From February 2003, bond prices rose and interest rates fell, apparently as an expression of the economy’s underlying weakness. Nevertheless, equity prices took off on a new, uninterrupted ascent, and the s&p 500 rose by about 20 per cent in the next six months. This was no doubt as the Fed had hoped. Nevertheless, by the summer of 2003, according to the Financial Times, the earnings-price ratio of the s&p 500 had fallen another 10 per cent or so to 3:1, compared to an historical average of about 7:1. The Fed was succeeding in keeping the business climate from darkening further. But, in so doing, it was actually sustaining the stock market bubble in the face of the equity price crash and ensuing economic slowdown. A significant correction could send the economy directly back into recession. 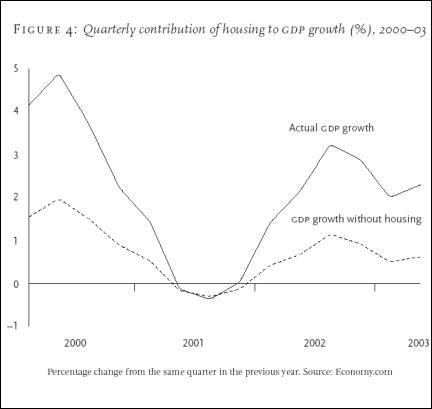 As equity prices started from the mid-90s onwards to outrun underlying corporate profits and gdp, housing prices too began to bubble up. From 1975, when data first becomes available, through 1995, housing prices increased at an approximately similar rate to consumer prices, so remaining roughly steady in real terms. During the first half of the 1980s, the housing price index fell about 5–10 per cent behind the cpi before catching up to it again by 1985; then, between 1985 and 1990, it rose about 13 per cent above the cpi, before falling back again to its level in 1995. Real housing prices in 1995 were thus the same as they had been in 1985 and 1979. But, from 1995 through the first half of 2003, the rise in the home price index exceeded the increase in the cpi by more than 35 points, historically an unheard-of rise in real housing costs. 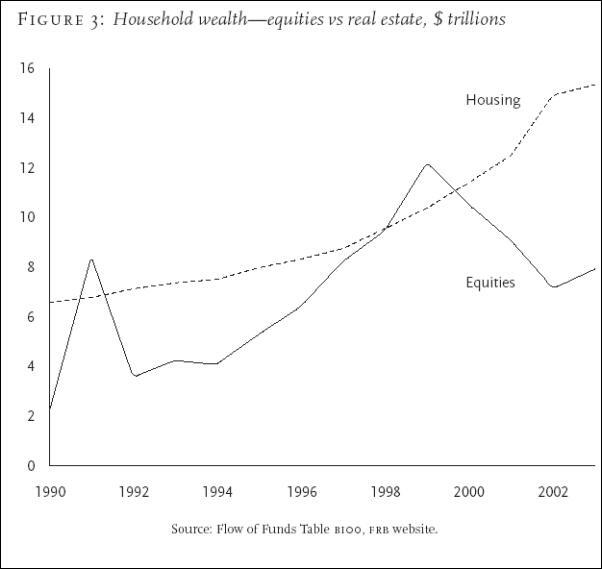 Thus in just the four years between 1995 and 1999, household wealth in the form of housing increased by 25 per cent. But between the time of the equity market’s peak of 1999 and its trough of the first quarter of 2003, housing values rose even faster, prices increasing at an average annual rate about 5 percent higher than that of consumer prices. In fact, real home prices rose more during those three years than in any other comparable period on record. As a consequence, while shares (including mutual funds) owned by households plunged in value from $12.2 trillion to $7.15 trillion in this brief interval, a drop of $5.05 trillion or 44 per cent, residential real estate owned by households rose in value from $10.4 trillion to $13.9 trillion, an increase of $3.6 trillion or 35 percent, and regained its former place as households’ number one source of wealth. 16 This and the preceding paragraph depend on Dean Baker, ‘Homeownership in a Bubble: The Fast Path to Poverty?’, 2003, available at Center for Economic Policy Research website. See especially Figure 1 on The Real Cost of Owning and Renting. 17 Time series on mortgage re-financing and cash-outs from it, constructed by Mark Zandi, chief economist at Economy.com, whom I wish to thank for his generosity in making this data available to me. In 2001, 2002 and the first half of 2003, mortgage equity withdrawals amounted, respectively, to an astounding 5 per cent, 7.7 per cent, and 9 per cent of US personal disposable income - playing an enormous role in sustaining consumer spending, in the wake of a radical decline of income growth. According to the Federal reserve, households use roughly 50 per cent of their cash-outs to finance increased consumer expenditures on everything from home improvement to vehicle purchases, vacations, educations, medical expenses, and, in the case of some hard-pressed families, even general living expenses. Another close to one-third of the cash is used repay higher-cost credit card and other instalment debt, freeing up income for more consumption. The remaining cash is used to finance other investments, usually real estate assets, tending to drive up housing demand, prices, and so in turn gains in household net worth. 18 Mark Zandi, ‘Housing’s Virtuous Cycle’, Regional Financial Review, August 2003, p. 13. 19 These results are based on simulations using Economy.com’s macroeconomic model. See Zandi, ‘Housing’s Virtuous Cycle’, p. 14 and fn. 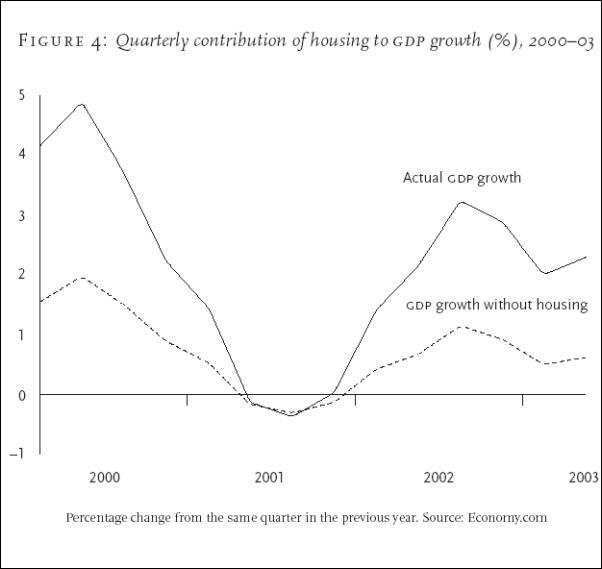 3, especially Chart 3; also Homeownership Alliance, ‘The Economic Contribution of the Mortgage Refinancing Boom’, December 2002, pp. 1–5; and Homeownership Alliance, ‘Mortgage Refinancing accounts for 20 Percent of Real Economic Growth Since 2001’, press release, 17 December 2002 (both available at www.homeownershipalliance.com). By pumping up consumer spending, especially by means of the debtdriven housing bubble, the Fed’s easy credit regime enabled Americans to keep raising their imports between 2000 and the middle of 2003, even as US exports declined in the face of the drop-off of purchasing power in most of the rest of the world. The consequence has been to prolong and deepen a pattern of international economic development that dates back to the first half of the 1980s, in which a steep rise in manufacturing imports and the US trade deficit widens the American current account deficit, expands US overseas liabilities, and fuels export-led growth throughout much of the rest of the world, above all East Asia. 21 ‘The Real Estate Market’, Speech by Alan Greenspan, 4 March 2003, frb website. This pattern was inaugurated in 1979–80 with the international turn away from Keynesian expansion to monetarist contraction as a means to combat the reduced profitability that continued to grip the advanced capitalist economies, especially in manufacturing. The ensuing jump in interest rates, reduction in the growth of social spending, and repression of wage growth did encourage the shake out of redundant, high-cost and low-profit means of production and, in that way, tended to contribute to the recovery of profitability system-wide. But, these same forces also brought about a sharp decrease in the growth of government and consumer spending, which, in combination with reduced investment growth, cut aggregate demand, inhibiting any uptick of profitability and exacerbating the slowdown. In the face of stagnant domestic markets, and further checks to deficit spending resulting from financial de-regulation, growth in most of the advanced capitalist world came to depend increasingly on stepping up manufacturing exports. But the ever greater generalization of export-dependent growth throughout the world economy only exacerbated the underlying tendency to over-capacity in international manufacturing which, if left to itself, would - sooner rather than later - have led to the seizing up of the international economy. Against this background of system-wide stagnation, the impetuous growth of US debt, in combination with a soaring dollar, became the central motor driving the world economy. Simply put, since the early 1980s the system has moved forward by way of the expansion of the US current account deficit leading to the piling up of ever greater us liabilities to the rest of the world, on the one hand, and further increases in over-capacity in the international manufacturing sector, on the other. As late as 1979–80, the US ran manufacturing trade surpluses and, leaving aside fuel imports, overall trade surpluses as well. But, from 1981 onwards, US interest rates skyrocketed, the dollar took off, and US deficits, both federal and private, broke new records every year. As a result, the us manufacturing sector sustained the worst crisis in its post-war history. 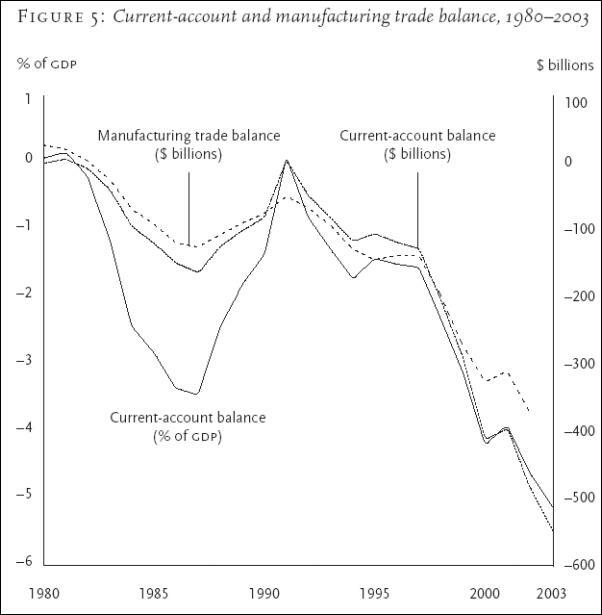 By 1987, with exports stagnating and imports skyrocketing, the manufacturing trade balance had gone a record $120 billion into the red and the current account deficit had reached an unprecedented 3.4 per cent of gdp. As the opposite side of the same coin, rising US manufacturing imports played a central role in pulling the world economy from the deep recession of the early 1980s and underpinning a new cyclical upturn. The indispensability of US borrowing and currency appreciation for the economic dynamism of the global economy was demonstrated to the hilt from the second half of the 1980s onwards. As the dollar fell sharply from 1985, as private borrowing temporarily collapsed with the recession of 1990–91, and as US public deficits began to dry up from 1993, the US manufacturing trade deficit fell as low as $57 billion (on average) in 1992–93 and the current account deficit was temporarily eliminated. The consequence was that, during the first half of the 1990s, the advanced capitalist economies experienced their worst performance of the entire post-war epoch (outside of the US and East Asian nics, whose currencies were tied to the declining dollar). Between the mid-1990s and the end of the century, there was still another reversal. The astounding run up of corporate and household borrowing, consequent upon the stock market bubble, in combination with a new takeoff of the dollar, now assumed the role previously played by public deficits in providing the subsidy to demand required to drive not just the us, but the world economy as a whole, by inciting a veritable tidal wave of US manufacturing imports. US manufacturing imports grew from $480 billion in 1993 to $1 trillion in 2000, more than doubling in seven years, while increasing as a share of manufacturing output by 50 percent. Already by 1995, the manufacturing trade deficit had jumped to $145 billion. It reached $271 billion by 1999, and increased by a further $100 billion to $369 billion by 2002. In this way, it accounted, by itself, for something like 60 per cent of the titanic increase in the us current account deficit between 1995 and 2002 and three-quarters of its absolute magnitude in 2002. In the second half of the 1990s, the US current account itself quadrupled in size and tripled as a percentage of gdp, setting new records almost every year. Then, between 2000 and the middle of 2003, it rose by another twenty percent, to an unprecedented $544 billion, five times its 1995 level. In so doing, it both profoundly exacerbated the difficulties of the US manufacturing sector, and provided an indispensable stimulus to the rest of the world economy, pulling Europe and Japan out of their doldrums after 1995, saving much of East Asia (and the rest of the world) from near collapse in 1997–98, rescuing Latin America from deep crises in 1994–95 and again in 1998–99 and, finally, keeping global depression at bay from 2001 to the present. The dollar’s decline against the Euro will tend, all else being equal, to make it easier for the US to export and harder to import. But, under current conditions, it may fail to bring about all that much improvement in the us trade and current account deficits, and risks undermining the European economies. Worsening recession in the EU would reduce European demand for US goods, offsetting much of the expected benefit for us exporters from the decline of the dollar. Between 2001 and the first half of 2003, the US trade deficit with Europe actually increased by more than onequarter, from $34.3 to $43.4 billion. Were the dollar to continue to fall in response to this widening gap, the Federal Reserve could be faced with an agonizing choice: either to let the currency drop and risk a wholesale liquidation of US properties by foreign investors - which could wreak havoc in asset markets and set off a serious run on the dollar - or raise interest rates and risk pushing the domestic economy back into recession. 22 See The Boom and the Bubble, pp. 208–9 and Table 8.1. 23 G. Chavez, ‘Weak capital influx seen choking dollar rally’, Reuters Online , 14 July 2003. 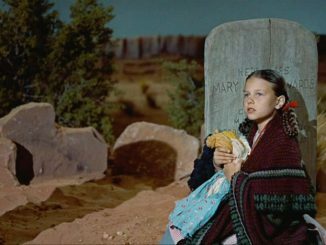 Thanks to Doug Henwood and lbo list for this reference. The East Asian governments have not, of course, pursued this course for altruistic reasons, but in order to sustain the rapid growth of their countries’ manufacturing exports to the US. Nevertheless, by closing the rising financing gap that would otherwise have resulted from the ever widening disparity between US exports and imports, East Asian governments have accomplished nothing less than to stabilize the US economy. In the absence of their purchases, the hyper-expansionary policies pursued by the Fed and the Bush administration would, almost certainly, have issued in a major fall in the dollar, leading to declining asset prices and rising borrowing costs and plunging the us, Asia, and the rest of the world back into recession, Still, it is hard to see how this symbiosis can be very long sustained. 24 D. Hale, ‘The Manchurian Candidate’, Financial Times, 28 August 2003; C. Swann, ‘Weak renminbi is both boon and bane for the us’, Financial Times, 26–27 July 2003; J. Hughes, “Asia’s currency manifpulation comes under scrutiny,” Financial Times, 24 November 2003.. Thus even were East Asian governments able and willing to continue to buy dollar- denominated assets to keep their own currencies cheap so as to subsidize their manufacturers’ exports, this process cannot have a long life. For then the upshot would be to hold down US exports and increase US imports, forcing up the American current account deficit yet further and impelling still greater East Asian investments in us financial assets, with ominous implications for the US and global economies. On the one hand, the influx of East Asian funds onto US financial markets, by pushing down the cost of borrowing, would tend, directly or indirectly, to fuel ongoing asset price bubbles in equities and real estate. On the other hand, the growth of East Asian exports - puffed up by both the high dollar and government-subsidized US demand - would further undermine US industry, while exacerbating over-capacity in manufacturing on a global scale. This is, of course, much the same syndrome - of rising asset prices and manufacturing over-production - that has dogged the world economy and its US component throughout the bubble-wrapped boom and the slowdown that has followed. 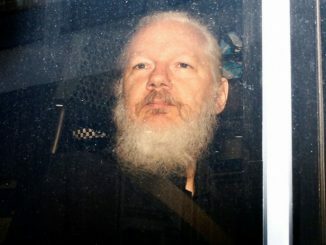 It is a self-undermining path, in which the inexorable rise of US obligations to the rest of the world enables it to grow through exports at the expense of US productive power, and therefore of the capacity of the US to honour those obligations - - a process that has already led to a stock market crash and a recession. v. a basis for boom? In order to keep the economy turning over while it worked off excess capacity and began once again to invest and create jobs, between the middle of 2000 and the middle of 2003, the economic authorities unleashed the greatest macroeconomic stimulus in US history. The Fed decreased its short-term rate from 6.5 per cent to a post-1958 low of 1 per cent (including reductions in November 2002 and June 2003). At the same time, the government’s fiscal position moved from a surplus of 1.4 per cent of gdp to a projected deficit of 4.5 per cent, or $450 billion. During the same interval, the trade-weighted value of the dollar fell more than 10 per cent. Nevertheless, despite this gargantuan boost, the economy barely budged. During the first half of 2003, real annualized expenditures on plant, equipment, and software still failed to grow. In the same period, annualized growth of gdp, at 2.35 per cent fell a drop lower than in 2002. It would indeed have been a third lower, just 1.5 per cent, had it not been for the huge and unsustainable leap in military spending on Iraq, which accounted for more than half of the economy’s 3.3 per cent growth in the second quarter. Meanwhile, unemployment rose to 6.2 per cent, and jobs were continuing to disappear at an alarming rate. In July 2003, the non-farm economy lost 57,000 jobs - after losing 83,000 and 76,000, respectively, in June and May - and non-farm employment fell 38,000 below its level of July 2002. The disparity between stimulus and response appeared to be a direct expression of the economy’s underlying weakness - its still unresolved problems of over-capacity and corporate financial fragility. By autumn 2003, however, the economy certainly was accelerating. gdp leapt forward at a 8.2 annualized pace, the largest quarterly gain since 1965. . Equally significant, job growth suddenly went positive to the tune of more than 100,000 per month in September and October. To round out the picture, non-residential investment sprang up at an 14 per cent annualized pace, the highest since the beginning of 2000. The economy seemed suddenly to have taken off. It may turn out, in retrospect, that the third quarter of 2003 did mark the start of a sustained cyclical upturn. Yet despite the spectacular headline numbers, it is not clear that US economic advance in the third quarter broke in a decisive way from its dependence on bubbles, debt, and consumption. . Once again, personal consumer spending, which expanded at a spectacular 6.4 per cent pace - including a whopping 26.9 per cent increase on durable goods - was at the heart of expansion. Along with the growth of residential investment, it accounted for 75 per cent of total gdp increase. What drove personal consumption? It certainly was not hourly real compensation ( excluding self-employed), which actually fell in the quarter by 0.2 percent for the whole economy, with the result that annualized total real compensation for the first three quarters of 2003 actually fell slightly compared to 2002. What put money in consumers’ pockets was, above all, households’ enormous cash-outs from mortgage financing. During the first half of 2003, these climbed to about 7 per cent of gdp, and must have played a central role in the spending spree of the third quarter. The Bush administration’s tax rebates of 2003 were also unquestionably pivotal, putting about $25 billion into people’s pockets in the third quarter - a whopping $100 billion on an annualized basis. While real pre-tax personal income grew by 1 per cent during the third quarter, after tax personal income increased by a stunning 7.2 per cent. What of investment, ultimately the decisive variable? A 14 per cent rise is in itself impressive and, taken in connection with the previous quarter’s 7 per increase, could bode well for the future. Still, a good part of this increase was almost certainly driven by the 2003 tax law, which allows firms to accelerate depreciation, but only if they do so by the end of 2004. In any case, annualized non-residential fixed capital investment in the third quarter was only 4.1 per cent higher than in 2002 and still 1.8 per cent and 6.9 per cent lower than in 2001 and 2000, respectively. This is not yet evidence of a boom in capital accumulation. The sizeable third quarter increases in employment, coming after almost three years of steady decline, were unquestionably the most promising sign for the economy, and perhaps point to a turn-around. But they were still insufficiently large to offset the numbers entering the job market, and thereby reduce unemployment; or to effect any significant increase in real total compensation and so to lift demand. Clearly, there remains a long way to go to transcend the worst cyclical recovery of employment in the postwar era. . In the 23 months following the official end of the recession in November 2001, private sector employment fell by a further 919,000, with almost every sector suffering major losses. Had it not indeed been for a gain of 753,000 jobs in education and health services, job losses in this period of ostensible recovery would have been well over 1.5 million. At the analogous point in the ‘jobless recovery’ following the March trough of the 1990–91 recession, i.e. January–February 1993, the economy was creating 277,000 jobs per month, more than double the 125,000 per month of September–October 2003. 25 ‘Virtually all of the new consumption during the [third] quarter was financed by tax refunds, mortgage refinancing or borrowing’: P. G. Gosselin, ‘us Economy Expands at its Fastest Pace Since 1984’, Los Angeles Times, 31 October 2003. That personal consumer expenditures fell in September appears to indicate that households had already largely spent their rebates. In mid-November Wal-Mart was sounding a warning over the strength of the recovery in US consumer spending,saying its shoppers remained cautious, favoured cheaper goods, and had little cash to spare: Financial Times, 14 November 2003. A sustainable rise in profitability? The necessary, if not sufficient, condition for significantly increased - and sustained - expenditures on plant and equipment and new hiring is obviously a dramatic and durable increase in profitability - the critical missing factor in the 1990s boom. In fact, so far, profitability has increased quite substantially from its low point, much faster than in the wake of the recession of 1990–91. The rate of profit for non-financial corporations for the first three quarters of 2003 reached a level 21 per cent above that of 2001, falling only about 10 per cent short of the 1997 peak. In so doing, it just about reached the average level of profitability for the whole of the business cycle of the 1990s. This is a significant development. It will be recalled, however, that the average rate of profit for the cycle of the 1990s did not rise palpably above the levels of those of the 1970s and 1980s, remaining about 20 per cent below the levels of the postwar boom, and proved insufficient to underpin a decisive break from the long downturn. For the economy to sustain a new boom by way of lasting increases in investment and employment, the impressive ascent of profitability that that began in the mid 1980s but which came to grief after the mid-1990s must, in effect, take up where it left off and go a lot higher. The two-fold question that therefore imposes itself is whether the current, so far dynamic, profit rate recovery can both continue and provide the basis for sustained increases in investment and employment - in view of the fact that, to this point, it has occurred for the most part by means of stepping up the exploitation of the US labor force, the most vulnerable in the advanced capitalist world. 26 One major question mark over the measured increase in profits is the degree to which it takes into account firms’ pension liabilities. By the end of 2002, according to Fed Governor Susan Schmidt Bies, 90 per cent of the defined-benefit plans of the s&p 500 companies were under-funded by a staggering $200 billion: see J. C. Cooper and K. Madigan, ‘A Jobs Recovery, Yes. A Hiring Boom, No’, Business Week,20 October 2002. With output growth muted till recently, the increase in profitability has been primarily due to a widening of the gap between what workers produce per hour and what they are paid per hour. The measured growth of output per hour has been very impressive - 5.4 per cent for 2002 and 4.35 per cent for the first half of 2003 for non-financial corporate economy, after 2.0 per cent in 2001 - while hourly real wages in the same intervals grew by only 1.9 per cent and 0.8 per cent respectively, after a 0.3 per cent gain in 2001. Some leading analysts are therefore already asserting that the miracle of productivity growth that never quite materialized in the 1990s - even though output per hour did palpably accelerate - is now upon us. By implication, all else being equal, a path to profitability revival has been opened up. But such a deduction is premature, to say the least. Its Achilles heel is obvious: so far, increases in output per hour have taken place in the face of a palpable decline in investment growth, i.e. the slower introduction of more and better plant, equipment and software. Between 1995 and 2000, the capital stock of the non-financial corporate sector grew at 3.9 per cent per annum, but was capable of bringing about technical advances sufficient to yield gains in annual output per hour of just 2.6 per cent. Is it really believable that, despite a more than 50 per cent reduction in the rate of growth of capital stock in 2001, 2002, and the first half of 2003 - to 1.8 per cent - technological advance suddenly brought productivity gains that were almost twice as high? The obvious alternative, and more plausible, explanation is that registered productivity gains represent not so much increases in efficiency - i.e. moreoutput from the same labour input - as more labour input per hour - i.e. speed-up and stretch-out. Such labor intensification yields not only higher profits, but also - very significantly - higher profit rates, since the additional profits are extracted without the need to add capital stock. In fact, in 2002 and the first half of 2003, the capital stock in the non-financial corporate capital stock (in nominal terms) barely rose, meaning that virtually all of the gains in profitability in this period were secured free of charge in terms of the plant and equipment laid down. 27 ‘Business Turns on the Tap’, Business Week, 17 November 2003. In response to this commonsensical explanation, it is argued that productivity gains have been hitherto repressed by an incapacity to put advanced equipment to proper use - but now ‘learning by doing’ has begun to bear fruit, and we can expect steady gains that could not be secured merely by the putting into place of great swathes of new capital. (R. Gordon, ‘America wins the prize with a supermarket sweep’, Financial Times, 20 August 2003.) But this seems hard to credit. One would expect learning by doing to occur gradually and continuously. Why would advances of this sort have been delayed for almost a decade, then have occurred suddenly and by great leaps.How could such discontinuous technological improvements have gripped enough of the economy to yield such huge gains in overall productivity increase? Nevertheless it is a real question how much further corporations can go in enhancing their profits by extracting still more labour per hour or day from their employees. And once firms have to begin to pay for gains in productivity and thereby profits by adding to their capital stock (plant, equipment, and software) - rather then securing them without charge via labor intensification - profit rate gains become harder to come by. By the same token , more lay-offs and speed-up, and slower wage increase, can only extend the undercutting of aggregate demand that has been pressing the American economy downwards, discouraging investment. In the 22 months following the formal end of the previous six recessions, employment rose on average by 5 per cent and total compensation by 9 per cent. But in the same time-span following the November 2001 trough of the latest recession, non-farm payrolls contracted by about 1 per cent, leaving total private real non-farm compensation unchanged. 28 D. Leonhardt, ‘Slowing Stream of New Jobs Helps to Explain Slump’, New York Times, 1 October 2003. Unfortunately, data on gross job increase and gross job elimination, as opposed to net job creation, is available only for the recent period. 29 E. L. Groshen and S. Potter, ‘Has Structural Change Contributed to a Jobless Recovery?’, Federal Reserve Bank of New York, Current Issues in Economics and Finance, vol. 9, no. 8, August 2003. Such a pattern is, of course, just what one would expect from a slowdown resulting, like this one, from a longer-term build-up of system-wide over-capacity in manufacturing, aggravated by the wealth effects of the asset price bubble from 1995 through 2000. Jobs were created, and increasingly so over the course of the 1990s, that had no hope of being sustained by the growth of demand, except in the shortest of runs.High technology industries alone, accounting for just 8 per cent of gdp, accounted for one third of the total increase in gdp during the second half of the 1990s. A large part of this output turned out to be superfluous - unsellable at a profit - with the consequence that in 2002 and 2003, 750,000 jobs, or 12 per cent of total employment at the end of 2001, were lost. It is obvious not only that a large proportion of these will never be re-created, but that of those that do re-appear, a significant number will do so abroad as a consequence of outsourcing. Not only are cheap labor manufacturing platforms expanding like wildfire, above all in China, but, thanks to digitization and vastly improved communications, so is service sector, or white collar job re-location, above all in India. By implication an entirely new set of jobs will have to be created in the US. But where will the demand for these arise, given that employment creation is itself such a central aspect of demand creation? The economy apparently faces a major coordination problem, as the New Economy industries that were supposed to make the running prove quite unable to do so. The Fed’s huge stimulus may actually have exacerbated the problem, by braking the shake-out of high-cost, low-profit firms through bankruptcies or mergers. In the third quarter of 2003, after nearly three years of slowdown, capacity utilization in manufacturing stood at 72.9 per cent (with high tech industries well below this). That was actually lower than in any quarter of 2001 and 2002 and in fact lower than in any other quarter of the post-war period, apart from 1982–83 and 1975. . This obviously dampens the motivation to invest in new plant, equipment, and software and probably to add more employees as well. 30. S. Morrison, ‘750,000 US high-tech jobs lost in two years’, Financial Times, 19 November 2003. Data on the numbers employed in high tech industries at the end of 2000 were not available. During the first six months of 2003, long term interest rates plummeted to near post-war lows, as the economy floundered, as investors assumed greater risk in their search for higher yields, and as the Fed seemed to promise to hold down the cost of borrowing until deflation was definitively defeated. A bond market bubble blew up. But when - scarcely drawing breath from an intensifying campaign to head off falling prices - the Fed suddenly announced its belief that the economic outlook was improving, the hitherto overbought bond market made a violent u-turn, and long-term rates shot up with a rapidity unseen for many years. Over the summer, bond prices stabilized. But the anxiety remained that this could be only the beginning - that interest rates would not only correct themselves, but continue to rise, as more rapid growth brought higher prices and greater need for credit. Were they to do so, they would pose a severe danger to stock prices, mortgage borrowing, and the dollar, threatening to unravel the recovery. Defying the bond market’s gloomy prognosis, the stock market rose without cease through winter, spring and summer 2003. Between its February-March 2003 low point and October 2003, the S&P 500 posted a remarkable 33 per cent increase, helping greatly to boost confidence. Yet, in so doing, its price-earnings ratio soared above 35:1, quite close to the highest level during the late 90s bubble. Can the market go much higher? Chief executives have been giving expression to their doubts. In autumn 2003, the ratio of sales to purchases by corporate insiders reached an all time record, at 6:1. Although the stock market seems already to have priced in the recent rise in corporate profits, and then some, further increases in company earnings could push equity values higher - yet at the same time these appear to have become increasingly vulnerable to shocks of any sort, leading to a correction. 31 S. Galbraith and M. Viviano, ‘The Missing Piece’, Morgan Stanley US and the Americas Investment Research, 3 November 2003. The mortgage refinance boom has, of course, been driven by a huge fall in interest rates and an unprecedented rise in housing prices. But both these processes appear now to have reversed themselves. Along with other long-term rates, mortgage interest jumped in reaction to the Fed’s gaffe of June 2003, and has been creeping up since. In the second quarter of 2003 (the latest for which we have data), home prices rose just 0.78 per cent, the slowest quarterly rate of appreciation since 1996. By September and October refinancing activity had fallen palpably. According to the Mortgage Bankers Association, US mortgage lending can be expected to plunge from $3.3 trillion in 2003 to $1.4 trillion in 2004, as interest rates rise from 5.8 per cent to 6.2 per cent (at 7 per cent, it would zero). If that happens, cash-outs from mortgage borrowing will obviously plummet, weakening what up to now has probably been the main basis for the growth of consumption and of gdp. The impact on a financial sector that has, for the past three year, been so heavily dependent for its profits on housing would likely also be severe. 32 Chavez, ‘Weak capital influx seen choking dollar rally’; A. Beattie, ‘Greenback’s fall may prove mixed blessing at home and abroad’, Financial Times, 8 October 2003. Meanwhile the Bush administration, in response to the outcry from industrial states bleeding jobs at a devastating rate and in preparation for the 2004 elections, had begun to pressure China - an easy target due to its mammoth trade surplus with the US - to allow the yuan to rise against the dollar. At the September meeting of the G7 in Dubai, Washington broadened its campaign, seeking to force down the dollar across the board. In November, having previously put up tariffs on steel imports in defiance of WTO rules, it slapped quotas on imports of certain clothing items from China. The aim, of course, is to shift some of the burden of the international over-capacity in manufacturing onto its leading partners and rivals, in order to speed the recovery of US jobs and investment. The Bush administration’s campaign has accelerated an already ongoing process of dollar decline. Although the US equity market has enjoyed a healthy run-up in terms of dollars, its performance in terms of euros has been much weaker, and expressed in yen, even worse. Weakening overseas demand for stocks has thus been putting ever-increasing downward pressure on the dollar. The steady, if slow, decline in US bond prices has militated in the same direction. Against this background, the Administration’s increasingly protectionist thrust has been taken as a sign of its increased determination to force down the dollar, whose exchange rate has now dropped sharply. By November, the euro had risen to an all-time high against the dollar, and the yen had reached its highest level in three years. 33 C. Baum, ‘Bush Gets Double “D” in Handling China Bra Flap’, Bloomberg.com, 20 November 2003; ‘Currency Wars’, Financial Times, 8 September 2003. 34. J. Wiggins, “Asian investors may drop Treasury bonds,” Financial Times, 8 September 2003; D. Bogler , “Asia backs out of the greenback.” Financial Times, 23 November 2003. Nevertheless, bringing the greenback down carries major risks for Washington. A high dollar in general, and East Asian purchases of dollar-denominated assets in particular, have been indispensable for the American recovery, such as it has been, allowing a hyper-expansionary US monetary policy without upward pressure on interest rates or prices. Should the dollar continue to fall, US equity and bond values will come directly under stress and inflation will increase. But if the price level rises, so will the cost of borrowing, threatening the low interest rates that have been the ultimate foundation for the cyclical upturn.. Any significant rise in interest rates would put an end to the enormous wave of mortgage borrowing that has driven consumption. It would also make it more difficult for the government to finance its enormous - and growing - budgetary deficit without raising interest rates and thereby jeopardizing the recovery, while adding to the downward pressure on asset values. Indeed, given that the rest of the world owns $7.61 trillion worth of US assets - 40 per cent of the US government’s tradeable debt, 26 per cent of US corporate bonds, and 13 per cent of US equities - a significant decline of the dollar has the potential to set off a rush to offload US assets, unleashing a violent downward spiral of currency and asset prices. If the Bush administration gets its wish, in other words, it may regret ever having made it. It appears that the borrowing and bubbles that have underpinned the US cyclical recovery are diminishing, putting downward pressure on consumer spending and increasing vulnerability to asset price shocks. If stock prices do brake, mortgage cash-outs tail off and the dollar slips further, then faster growth of investment and jobs will have to come sooner rather than later, to prevent another slow-down, or worse. In theory, the sharp rise in US profitability should offer a strong basis for a surge of corporate spending, and the recent, more rapid, GDP growth should push earnings still higher. Corporate expenditure has not, up till recently, much materialized, but faster growth of both investment and jobs can probably be expected in the short run, with the usual multiplier effect. Nevertheless, the sustainability of increased dynamism is itself open to question, especially given the legacy of the post-2001 upturn. Will not more rapid expansion make for higher borrowing costs at a time when households, the government, the corporations and the financial sector itself have all become vastly over-extended? Will it not also induce a ballooning current account deficit, at a time when the dollar is already falling? Can an economy move forward by way of the expansion of service and financial sectors catering to consumption, when key goods-producing sectors remained weighed down by over-capacity and reduced profitability, when overseas producers are grabbing ever greater shares of the US goods market, when exports are falling ever further behind imports with no hope of closing the gap at current exchange rates, and when the US depends upon the largesse of East Asian governments to cover its international obligations? The US economy is in uncharted territory. Its capacity to find its way remains in doubt. (1) Personal consumption expenditures, non-residential investment (structures and equipment and software), exports and imports of goods and of services, government consumption expenditures, personal income, disposable personal income, total wages and salaries, contributions to growth of gdp: National Income and Product Accounts (nipa), Bureau of Economic Analysis (bea) website. (2) Gross value added, compensation, employees selfemployed, by industry: US Gross Product Originating by Industry, bea website. (3) Net capital stock, depreciation, investment (current and constant) by industry: Fixed Asset Tables, bea website. (4) Corporate profits: nipa Tables 1.6 and 6.16, bea website. (5) Employment and wages (nominal), by industry: National Employment and Earnings, Table b Historical Data, Bureau of Labour Statistics website. (6) Borrowing and debt outstanding for government, households, non-financial corporations: Flow of Funds, Federal Reserve Board website. (7) Purchase and sale and ownership of assets by non-financial corporations, households, rest of the world: Flow of Funds, Federal Reserve Board website. (8) Industrial output and capacity utilization: Table g17, Federal Reserve Board website. (9) Non-farm, manufacturing, non-financial corporations, total economy: value added (nominal and real), output per hour, total compensation, compensation per hour (nominal and real), hours worked: Industry Analytical Ratios for business, manufacturing non-financial corporations, total economy, Bureau of Labour Statistics (hard copies available from bls). (10) Interest rates, equity prices, price-earnings ratios: Economic Report of the President 2003, Washington, dc 2003. Find more from Robert Brenner on InfoPages.